Is the world ready for a kinder, gentler Sport Utility Vehicle? Land Rover is betting on it, and the rugged British off-road brand will reportedly debut its hotly anticipated LRX at the Paris Motor Show later this year. Shortly thereafter, the production LRX will make its North American debut in LA. 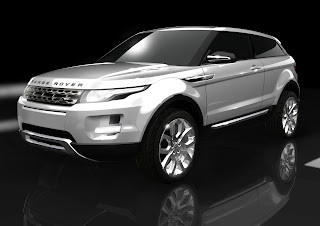 According to Automotive News, the LRX will go on sale in the third quarter of 2011. It's first seen the LRX Concept at the 2008 edition of the Detroit Auto Show, where it was generally well received by both the press and the showgoing public. The LRX is expected to be Land Rover's most efficient model and is likely to be offered with some sort of hybrid powertrain. Late last year, Autocar reported that Land Rover's first hybrid drivetrain would include a 3.0-liter diesel V6 engine mated up to a 25kW electric motor. The system would be a full parallel hybrid, meaning it could operate on any combination of gasoline or electricity using its onboard lithium ion battery pack. Pneumatic pop star-turned-fashion maven Victoria Beckham has been named the "creative design executive" for Range Rover on the eve of the famed British brand's 40th anniversary.